BEAD BUSTER: Why Didn't I Think of That?! Each and every year there are trade shows all over the USA for the offroad world. This year the Dealer Expo in Indianapolis brought with it hundreds of dealer-specific vendors to showcase a wide variety of new products. 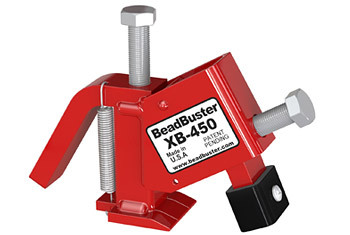 One product that caught our attention was the new Bead Buster tool. As many of you may know, the hardest part about changing tires is getting the bead broken off of factory rims. This can even be hard on some after market wheels as well. The effortless use of the Bead Buster gets the job done quickly. It's perfect for all tool boxes and quite frankly it is a must have for the do it yourselfer in the family. Simply spraying the rim and tire bead with mild soapy water and slipping the tool into place starts the process. Using a cordless impact driver the bolt on the front of the tool pulls the wedge foot between the tire and rim. The second bolt on top is then used to lower a foot that pushes the tire off of the bead. The front clamp foot pad protects custom wheel surfaces so no worry of damaging the cool wheel on your ATV or UTV. This is an over-simplified explanation of its use so visit the bead buster website and watch a video explaining in more detail. This is a must have tool and at around a hundred bucks you can afford to have one too.